Being so early to the even I managed to snag a front row seat, the closest seat to the chair where presumably my idol would be seated. I sat and read the book I had just purchased, in hopes that I could find some way to ask an original question. I wanted to know something about her that she hadn’t told the world in one of her many books. When I looked up from “Reason for Hope” I saw a few people pointing to the back of the small ball room. There she was. Jane Goodall. She was simply standing there, in a back corner, one hand on a suitcase handle surveying the room of people. I stood up, leaving my book to mark my precious front row seat, and found a group of my primate conservation MsC cohorts. We are stood nervously giggling and taking turns staring at the woman who had, I’m sure in all of our cases, had such a large impact on our lives. Finally we got up the courage to walk over and (yes, we actually spoke with her!) ask for a group photo. “One, two, three… Chimpanzee!” Jane said in a happy twitter. “Chimpanzee!” we all responded, excitedly. We mulled around for a few more minutes, discussing how close we were able to get to the Jane Goodall, before returning to our seats. 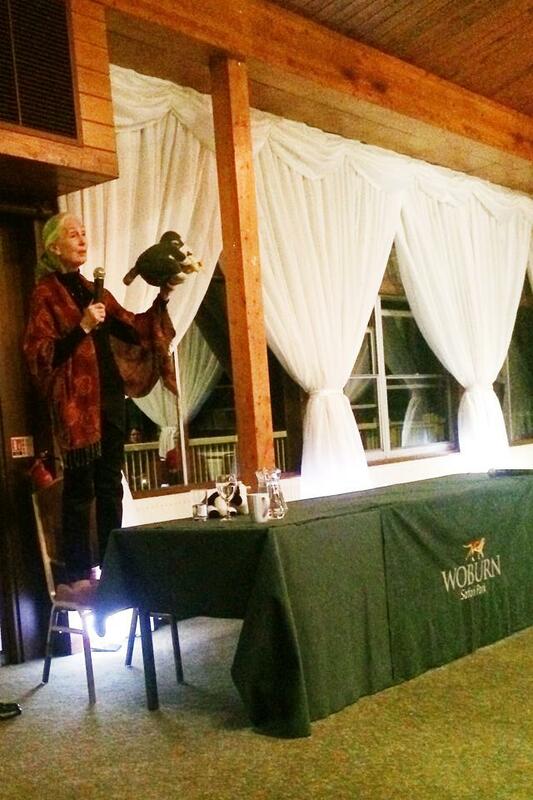 The audience laughed at the sight of Jane Goodall bouncing lightly on the chair while the zoo director looked mortified. You knew he was wondering what would be of his job if Jane fell off of a chair at his event. Jane waved him off and began speaking. You can read each of her books countless times, but until she is there, standing on a chair, wearing a shall covered in red flowers with her black shoes kicked off to the side, you can’t possibly feel how sincere she is about every word she is saying. She has probably repeated this speech thousands of times, but it doesn’t matter. She means every word. We think of Jane Goodall as a pioneer. I know on more than one occasion I have thought Oh, look at that amazingly brave woman, taking a chance and having the guts to set up a tent in the middle of the jungle with no one around but her, the chimps and her mother. But Jane said something that really put it into perspective. Many people think it takes courage to follow your dreams, and in a way, it does. But when you arrive at a spot in the jungle and you are told to pitch your tent and get some rest for the early morning of searching for chimps the next day, it isn’t fear thats pumping through your body and causing your heart to beat at about a thousand beats a minute. It isn’t fear that keeps you up at night as the sounds of the jungle seep into your very being when your cohorts grow quiet. It’s excitement. Jane Goodall’s words hit so close to home I could hear the bush babies crying in the dead of night in the Sierra Leonean jungle. I could smell the popcorn-like scent of an angry cobra on my first hike through the bush. I could see as plain as day the first signs of real, wild chimpanzees that came along just as I was too exhausted to continue. And I remembered. There was no fear. It took no bravery, no courage, no leap of faith. I was where I was supposed to be. I wanted to be in that jungle with all my heart and I was thrilled. Jane spoke of the time she attended a conference in 1986 in Chicago. A single session on conservation was all it took and her life was once again changed forever. She saw that across Africa, chimpanzee numbers were dropping and forests were shrinking and people were suffering. Jane realized that there was more to conservation than telling people to stay off of a piece of land with little explanation and no compensation for what what might be lost to those people. She left that conference realizing that bettering the lives of people and making them less reliant on the forest or on crops the chimpanzees may raid will help everyone in the long run. If I’ve said it once, I’ll say it again: People are not going to care about conservation if they are hungry. But Jane’s focus is not just on chimpanzees. She hopes for a brighter future for all animals. She encouraged the crowd of fifty or so people to attend the march for elephants and rhinos on October 4th. She encouraged us to really care about where our food comes from and that even cows have feelings too. She created a space that was filled with electricity. I think that every single person in that room was inspired, in that moment, to change the world. After the talk ended I handed my book off to a friend to get it signed. I had hired a taxi to drive me back to the nearest bus station and he was set to arrive in ten minutes. I walked outside and it was like seeing the stars for the first time. The weather in England has been unseasonably warm and tonight was no exception. There was not a cloud in the sky as I stood, coat in hand, watching the stars and waiting in the pitch black for my ride. I took a deep breath and reveled in the night as Woburn’s lions sang in the distance. Unfortunately not everything can go as planned and my taxi driver forgot me and, after a few phone calls, promised to be there in forty five minutes. I decided to head back inside and see if my cohorts were still around, and maybe get back in line to get my book signed myself. I must have been gone longer than I realized because the room had almost completely cleared. The line in front of Jane had come down to about five stragglers, so I decided to put myself at the end and get a picture. Jane sat on the table she probably should have been behind, drinking what looked to me like a dessert wine. She looked exhausted. I knew she traveled for over 300 days per year, and that this was a life she had chosen, but I still felt almost guilty to rob her of any quiet and ask for a picture. But as my time came and I was the last person left standing she smiled and I was able to stammer out “Can I get a quick photo?” I handed my phone off to her assistant and stood next to her. This would be my last chance. I could tell her all about my (well, maybe they aren’t mine, but I still feel like I deserve a bit of ownership) chimpanzees in Sierra Leone. 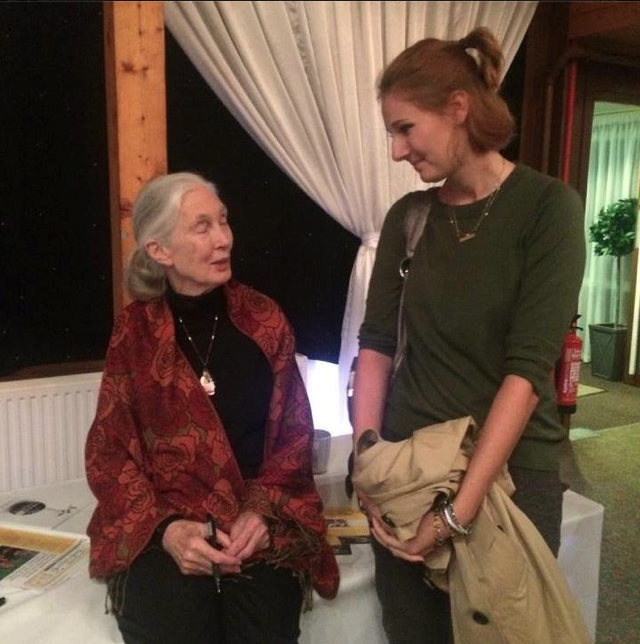 Maybe we could bond, maybe she would ask me questions about my research and she would think I was incredible and brilliant and of course, Jane Goodall, I will become your protégé! “I studied chimpanzees in Sierra Leone, you know,” was what came out instead. And I all of a sudden felt humbled by her presence. In reality how could my few brief weeks compare to her fifty years of making a mark? She asked who I had studied under, naming off a few doctors I had never heard of, and we talked of the state of Sierra Leone since the outbreak of Ebola. I told her I was worried for my friends I had made there, and for my chimps. “Oh, poor Sierra Leone,” she replied, looking at her hands. 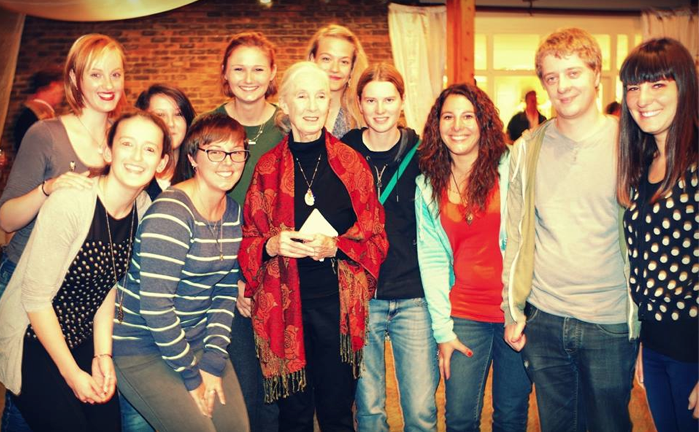 Her assistant handed me back my phone, letting me know that my allotted time to bask in the presence of Jane Goodall was up. When my taxi finally arrived I got in and stared out the window as the drive sped through the deserted streets of Woburn. I stared out the window as the countryside whipped by and noticed a show of fireworks off in the distance. It was one of those rare moments where the sky perfectly reflects how you feel, as it always magically seems to do in movies. Previous PostLions at the Tower of LondonNext PostDon’t feed the ducks! What a wonderful story you have shared of the night you enjoyed with Dr. Jane and will forever remember… thank you so very much for writing about this! Thank you so much for taking the time to read it! I appreciate it!